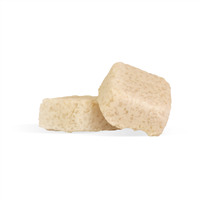 Lavish European spa salts combine with foaming bath whip and three butter soap to create these single use cubes. 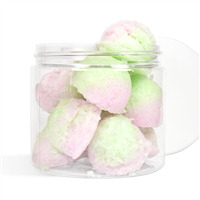 Scrub with one of these cubes in the shower or bath to gently exfoliate skin and trigger the uplifting scent of peppermint. Use these before summer to get your feet flip-flop ready or gift these around the holidays. Peppermint is a classic scent suitable for all seasons! Sea Salt, Propylene Glycol, Sorbitol, Glycerin, Sodium Laureth Sulfate, Sodium Stearate, Sodium Myristate, Sodium Laurate, Cocoa Butter, Water, Disodium Lauryl Sulfosuccinate, Stearic Acid, Sodium Chloride, Diazolidinyl Urea, Iodopropynyl Butylcarbamate, Titanium Dioxide, Fragrance, Red 33. "Recipe could use some work"
COMMENTS: I have to say I love the smell of the peppermint the issue I had was measurements. I bought a jelly roll pan that I thought was the correct size turns out it was to big. My product didn't spread evenly. Than trying to cut it was a nightmare. I ended up buying an ice cube tray with silicone bottoms and using mini cupcake tray. When I remelted my entire batch the salt seemed to have sunk to the bottom and I just scooped the salt in the trays first than added the liquid. Needless to say they lost some suds in all the heating and reheating but the look great and smell great just not a great exfoliating soap. Possibly due to the reheating. • I would advise on the tray size to use. • I would advise use a mold. COMMENTS: This was by far my favorite kit. It was an absolute hit with customers and have been selling it since I first tried it. COMMENTS: This kit was so easy to use! I made it for the first time and was amazed at my results. They looked just like they were supposed to and look so pretty sitting in their jars. I can't wait until my customers try these! COMMENTS: This is the first and best kit I have ever bought. It was nice to have everything handy and exactly what the recipe asked for. My scrubs came out exactly like the photo and I am very happy with them. I think I am going to check out other kits to buy. Its was a great deal buying everything together in the kit. COMMENTS: I've sold this product to many moms. They love the scent as well as the fact that exfoliating means smoother legs for a longer period of time. It's a must have for all my moms and mom-to-be's! I did however dial down the scent slightly. It was a little overwhelming. 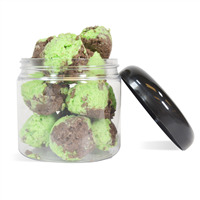 COMMENTS: The peppermint salt scrub cube kit was well received by customers. The scent is not too overpowering and the cubes were easy to make. I will be purchasing this kit again! • Customers like the product! COMMENTS: The directions for this kit were easy to follow. I substituted a different FO & color so it was more 'Springy' looking and they turned out great. I tested a cube and it left my skin very soft without the feeling of using a harsh scrub. Great product! "One of my favorite products, ever!" COMMENTS: At first I was hesitant, as usual, but I am extremely happy I bought this kit. The Peppermint smells fantastic, and the Salt Scrub is amazing. Leaves your skin with a slight tingle, and smoothe as ever. Defintely one product I will continue to make. "This is a great kit"
COMMENTS: This kit was easy and they look beautiful in the jars. I will be making this again! COMMENTS: This was the very first product I made after my first order arrived. Not only was it very easy to make, the scent of the soap wafted through my entire house! The bars are great for hands or feet; the sea salts scrub while the soap completes the cleansing job, and the scent refreshes tired feet. My hands are always into something, but using this product keeps them from drying out. This is a wonderful, fragrant product! "Perfect for Christmas presents, even for the guys!" COMMENTS: This is such a cool recipe. I use salt and sugar scrubs all the time, but i always end up wasting a fair amount of the scrub just because it slides off my skin or the loofah soaks it in. with these, theres no waste, and you get the same effect as a regular scrub. i WILL be buying more of this kit, no doubt about that. COMMENTS: Love this kit, and so do many of my friends!! 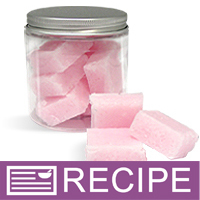 COMMENTS: I made scrub cubes using several fragrances and it doesn't matter which one I use, it is always a hit! I will continue to make this product! COMMENTS: My customers love the smell of this salt scrub soap! My husband has to do the stirring for me, but that's just me being weak! But be forewarned, you really have to stir this to get the salt to suspend in the soap mixture. It's worth it though for the adorable cubes of salt scrub in the perfect jars. Everything you need is in the kit. So convenient. I love using the left-overs that didn't fit in the jars myself. COMMENTS: so much fun! My customers love it too!!!! "Can salt be replaced with sugar and if so then how much sugar would you use?" Staff Answer Yes, you can substitute sugar for the salt in this recipe. You will need to test to see how much sugar to add to get to the correct consistency and thickness. "What size of Jelly Roll pan should be used? There are several "standard sizes" and not sure which one should be used for this recipe." Staff Answer The dimensions of the Jelly Roll pan we used for this recipe are: 15.25" x 10.25" x 1"
"Can this recipe be poured into a mold like the currently features warm vanilla scrub?" Yes you can. The directions here say pour into a pan then let harden and cut. Skip the pan and use a mold of your choice. "I really like this kit but all my salt went to the bottom as I saw this coming as I was doing it. What will help or what can I do to have the salt more blended as this really takes away from the scrub.."
Staff Answer The soap base was too hot when you poured it, which is why the salt did not suspend. You want the soap base to be just starting to get thick. In step 9 of the directions for the Kit it states that you should let the soap sit for up to 5 minutes, which is done to let the soap cool. If you would like, you could try remelting the soap and allowing it to cool before pouring it into the mold again. "Why doesnt this kit come with the jelly roll pan, since thats what its made in. The other kits that involve molds come with them." I believe they assume that everyone has a pan like this already. Also this makes the kit more affordable.